Adrian Malone (1914-2006) left a legacy of fine design and gentlemanly conduct which shaped the firm which still bears his name. A 1937 Harvard graduate, he received his architectural degree from the Harvard Graduate School of Design in 1941. 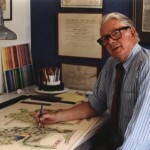 Mr. Malone acquired his professional experience in San Francisco, first as a Naval Engineering Officer, then as apprentice in several well-known architectural offices, and finally as a partner for fifteen years in his own firm of Malone and Hooper, which produced the masterplan design for the VIII Winter Olympic Games in Squaw Valley (1960) and numerous notable residences in Northern California. He chose to leave the San Francisco area for less populated Wyoming, where he complemented his residential work with museums, including the Plains Indian Museum in Cody and the gallery at the Bradford Brinton in Big Horn; libraries; and work in Yellowstone National Park. In his 70’s Mr. Malone began his gradual retirement from the firm, remaining available for design consultation either from Big Horn, Wyoming or from southern France, where he maintained a residence.